The story is about a little boy Jamie who plants a pumpkin seed in spring and watches the seed sprout, grow into a pumpkin plant, pumpkin plant grow a pumpkin flower and the flower grow into a big giant pumpkin. For Halloween, Jamie converts the giant pumpkin into Jack-O-Lantern and in the process he gets pumpkin seeds to plant in the spring. It's an excellent book to teach the life cycle of Pumpkin. Once they are down, roll the paper into a cylinder in such a way the edges are touching and fasten it with a sellotape. Make the rolled paper stand up with the strips facing up. 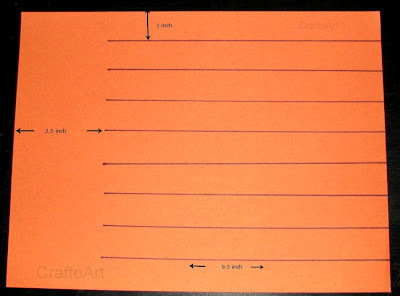 Make a inch fold to the end of the strips as shown in the above picture. Apply glue on the 1 inch fold. 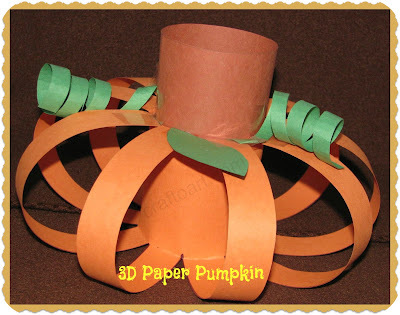 Cut a couple of leaf shapes from the green construction paper and add the leaves to the top of the pumpkin with glue/tape. I made the kids write their name on the leaf. Don't they look beautiful! Just like a pumpkin Patch! 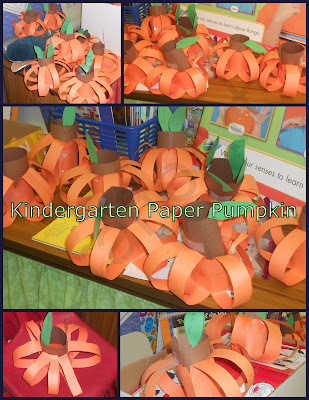 The Kindergarten teacher gave the idea of adding yarn to the top of the pumpkin so that they can be used as a hanging decoration. The Pumpkins hanging from the classroom loft! What a wonderful collection of pumpkins! Thank you for linking to Read.Explore.Learn. I will be sharing this post on Read.Explore.Learn. today. These are so cute. I especially love them as garland !